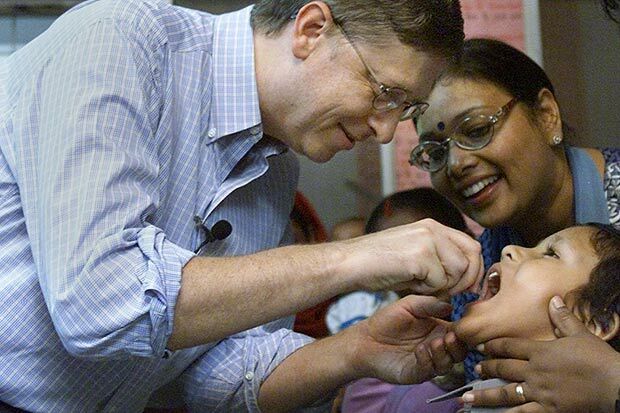 Gates, GAVI and Murder Inc.
Several years ago, the Bill and Melinda Gates Foundation and the Rockefeller Foundation, along with the World Bank, UNICEF, the WHO and a group of pharmaceutical companies, united all in something called GAVI and set out to bring massive polio vaccination first to India. GAVI: The Vaccine Alliance was founded by the Gates Foundation in 2000 as a “public-private partnership” to unite in assaulting poorer developing countries with the Big Pharma vaccine industry they would otherwise be spared. An article in the Indian Journal of Medical Ethics in 2012 concluded, “In 2011, there were an extra 47,500 new cases of NPAFP. Clinically indistinguishable from polio paralysis but twice as deadly, the incidence of NPAFP was directly proportional to doses of oral polio received. Though this data was collected within the polio surveillance system, it was not investigated.” Instead, Gates and Company proclaimed India “polio” free. By calling it non-polio, they defined polio as eradicated in India. But their vaccines are killing and paralyzing tens of thousands of children. So by the WHO semantics the GAVI vaccines did not caused a single case of “polio.” It did cause 48,000 cases of something far deadlier and more damaging, Acute Flaccid Paralysis, a condition the WHO admits is clinically indistinguishable from polio and which occurred in direct proportion to the doses of polio vaccine received. A similar phenomenon took place at the same time in neighboring Pakistan. In 2011 the Paktstan Tribune reported, “A government inquiry has found that polio vaccines for infants funded by the Global Alliance for Vaccination and Immunisation are causing deaths and disabilities in regional countries including Pakistan. Geneva-based officials of GAVI, Jeffrey Rowland and Dan Thomas, were contacted by e-mail but they did not respond. “ GAVI spent a mere 7.8% of the total cost of the mass vaccination in Pakistan, of Rs26 billion. The Tribune continued, “Pakistan will be spending Rs24.2 billion from its own resources on the purchase of new and under-used vaccines at much higher cost as compared to their equivalent vaccines.” The Gates-Rockefeller-WHO polio vaccination program in Pakistan killed an estimated 10,000 and crippled tens of thousands more. The pattern is clear. The global agenda of Rockefellers, Gates, Clintons, Bushes and their very rich loveless friends is racist. It calls for elimination of non-white populations, genocide. Their tools of choice include wars everywhere from Afghanistan to Pakistan to Libya to Syria to Ukraine. It includes campaigns of massive select vaccinations in war-torn countries. It includes setting the CIA and Mossad to the job of creating fake Islamic “jihadist” terrorists to kill and main and create the cover for a Washington “war on terror.” Their only problem of late is that these strategies are failing. That’s bad news for the paranoid oligarchs, good news for sane remnants of the human race, human beings.